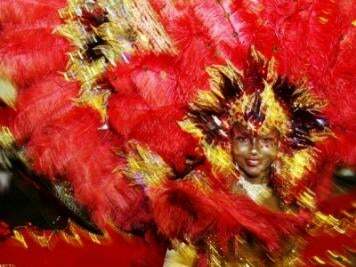 French settlers introduced Carnival to Trinidad in 1785, staging annual pre-Lenten masquerade balls. Their African slaves quickly adopted it, staging their own pre-Lenten celebrations but mainly mimicking and mocking their French masters with elaborate costumes and dancing to the beat of drums. They also composed their own songs — the first calypsos — for the occasion, employing clever double entendres to lampoon their masters. So cleverly was this done that some French masters actually enjoyed the calypsos, never realizing that they were the targets of scorn and vituperation. In no time at all, the annual pre-Lenten fete became a favorite festival among African slaves and quickly spread to all parts of the twin-island state of Trinidad and Tobago. Today, Trinidad Carnival — which officially takes to the streets this year at 5 a.m. on Monday, March 7 — is celebrated as a national festival in which all sections of the community take part, as do many tourists from North America and Europe. Masquerade, or "mas," as it is now commonly known, remains a key feature of the festival. Hundreds of bands with thousands of participants annually parade down the streets, with each band adopting a masquerade theme — North American Indians, the British Royal Court, denizens of the undersea world, astronauts, African warriors, Egyptian pharaohs. Many of these costumes are elaborately structured and take months to put together. Bandleaders open mas camps, where the costumes are put on display; would-be masqueraders visit these camps and pay for their costumes when they eventually decide which mas they will be playing in the streets this Carnival. The masqueraders dance to the beat of steel bands, their musical instruments made from oil drums, which were introduced here in the 1930s, displacing the original skin drums and later bamboo stalks. Today entire steel band orchestras, made up of multiple sections, compete for prizes in the annual Panorama steel band competition, which is held in the Queen's Park Savannah on the Sunday night preceding the start of the mas in the streets. This competition, known as Dimanche Gras, also features a similar competition among calypsonians and among kings and queens of the various bands. The competition has been even more keen this year since the government announced that the first prize in each category would be TT$2 million (approximately $320,000 in U.S. dollars). The calypso competitions include a contest for Chutney Soca (an Indianized form of calypso) Monarch. Similar calypso competitions are held among schools. Even prisoners take part in annual calypso-singing competitions, for which prizes are awarded. The street mas goes on every Monday and Tuesday before Ash Wednesday. But Trinidadians really begin preparing for Carnival immediately after Christmas each year. House and club parties, or fetes, are staged nightly. Calypso tents open for business by early January. Steel bands begin practicing their tunes as early as late December. Sleepless nights are the norm in the run-up to this annual street festival. Back home for Carnival this year is the legendary calypso icon the Mighty Sparrow (née Slinger Francisco), who now lives in New York. Sparrow shot to fame in the 1950s with the popular composition "Jean and Dinah," a calypso celebrating the departure of American soldiers from their World War II base in Trinidad, and Sparrow's determination to make sexual hay with the local prostitutes now deprived of their American clientele: "The Yankees gone and Sparrow take over now." Today's calypsonians no longer rely on sobriquets, preferring to use their own names, like Machel Montano, Patrice Roberts, Bunji Garlin and his wife, Faye-Ann Lyons. When Carnival 2011 takes to the streets at 5 a.m. Monday, at the beginning of jouvay (or jour ouvert, the opening of the day), it will be doing so under Trinidad and Tobago's second Indian government since independence in 1962 and its first female Indian prime minister, Kamla Persad-Bissessar. She formed a disparate grouping of opposition parties under the People's Partnership to defeat the 55-year-old People's National Movement government of Prime Minister Patrick Manning in the May 2010 general election. Traditional antagonisms between Afro- and Indo-Trinidadians, who make up the bulk of the population of 1.3 million, have waxed and waned over the years and are still evident in some of the calypsos being sung in the 2011 Carnival season. But generally this traditional hostility has largely dissipated, never mind its occasional flare-ups. Calypsos are still popular forms of double entendre, usually aiming brickbats at whichever government is in power, and this year is no exception. Not even the U.S. Embassy in the capital, Port of Spain, escaped that critical scorn, with several calypsos taking aim this year at the U.S. government's unpopular nonimmigrant-visa policy. In fact, at the National Women's Action Committee calypso-queen competition this year, the winner, Heather McIntosh, took the first prize with a song titled "Keep It," which was highly critical of that policy. The calypso began with a few recognizable strains of the U.S. national anthem. By late February 2011, all of the major hotels in Trinidad and Tobago were reporting that they were booked solid for Carnival. These included the three leading hotels: the Hilton Trinidad, Hyatt Regency and Carlton Savannah. Carnival, of course, is a major tourist attraction, but many nationals of Trinidad and Tobago who live abroad return home every year to take part in the festival. Despite the popularity of Carnival, the two official days of the national festival are not public holidays. Employers, however, have long grown accustomed to giving their employees time off for the street fete, and by Carnival Tuesday — when all the masquerade bands hit the streets in full costume until midnight and the festival is officially declared over — the country is virtually in lockdown mode. The effervescent Port of Spain, and Trinidad's other towns and streets, take on a ghostly atmosphere come Ash Wednesday morning, when many of the faithful go to the churches to receive ashes on their foreheads and begin 40 days of Lenten fasting. But have no doubt that, even during Lent, Carnival enthusiasts are already beginning to plan for the next year's street fete. Raoul Pantin is a renowned Trinidadian journalist and social commentator.